I bought this succulent 3 years ago, and it's been doing really well. It has also been growing really fast! However, it has started to lose color about a year ago. 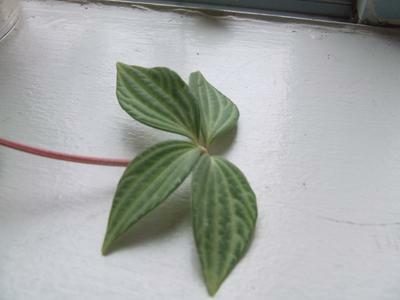 It is still growing, and the leaves are not brittle and no spots or anything like that, it just looks very discolored (particularly the old leaves, not the new ones). What is the issue? Maybe I should repot to a bigger pot? I assumed succulents don't need much root space, but maybe this pot is just too small.. 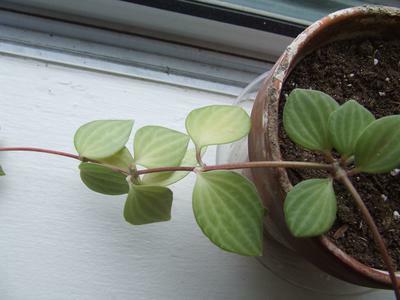 This looks like some kind of Peperomia, which although they don't like intense sunlight, they do need it bright. This would explain the lower older leaves showing that paling. If there isn't quite enough light for the new growth to thrive, it will shed the lower leaves - survival of the fittest, right? So move it into slightly brighter conditions, not full sun, but maybe try a different window, or under a grow light. Repotting it would certainly help, or maybe a shot of some kind of water soluble fertilizer. What is the issue? Maybe I should have repotted to a bigger pot? I assumed succulents don't need much root space, but maybe this pot is just too small.. I ended up repotting this plant just a few days ago, and the pot you see in the photos is the new one. The original was about 2'' by 3'' or even less. I answered your question, but now I've got a better idea of the plant and the pot. That's the perfect size. Now it just needs some time to aclimmate to it, and yes, definitely it's nutrient deficient. But, don't go giving it too much fertilizer! Small amounts good, overfeeding bad. Now that it's repotted, be patient and let it rest. Thank you for the advice. I am giving it 3-5 days in the new pot, and will then water with my new Schults 2-7-7 cactus fertiliser. Never used it before (my previous one was "plant-prod" 20-20-20 and I wasn't happy with it. ), so I will let you know what happens. Thank you again!